The second novel in the Braided Path trilogy picks up the story a few years after the end of the Weavers of Saramyr. The initial action takes place on the distant continent of Okhamba as a group of explorers are pursued from the depths of the rainforest having discovered some crucial information about the background of the Weavers who dominate Saramyr society. The initial part of the story features some action scenes more memorable than anything in the first novel and overall the storytelling does feel more assured in the second book, the climactic battle also being more compelling than any of the conflict in the first book. There is some decent character development here, and one of the new characters, Tsata, is one of the more likeable and interesting characters in the series. Although Tsata does provide an interesting outside perspective on Saramyr society through his conversations with Kaiku, he does feel a bit clichéd at times as well since his role seems to be the supposedly uncivilised forest dweller who could teach the more refined people of Saramyr a thing or two about how to live their lives using the ancient wisdom of his people. The Weavers continue to simultaneously be effective villains and unsubtle caricatures. More interesting is the Red Order which opposes them, their leader Cailin is a more complex and more interesting character than the Weavers, being nowhere near as unpleasant but still potentially as dangerous and ruthless as her opponents. Whereas the first novel was often a bit predictable there are a couple of surprising plot developments here and the ending of the book did set things up for an intriguing finale in the last book of the trilogy. 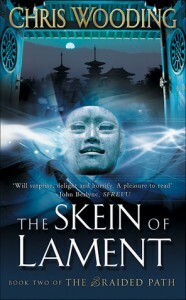 The Skein of Lament is an improvement on the Weavers of Saramyr while still not quite being as compelling as the best of the modern epic fantasy series.